Dear brothers and sisters, do remember one thing. Malala day is not my day. Today is the day of every woman, every boy and every girl who have raised their voice for their rights. There are hundreds of human rights activists and social workers who are not only speaking for human rights, but who are struggling to achieve their goals of education, peace and equality. Thousands of people have been killed by the terrorists and millions have been injured. I am just one of them. So here I stand... one girl among many. I speak - not for myself, but for all girls and boys. I do not even hate the Talib who shot me. Even if there is a gun in my hand and he stands in front of me. I would not shoot him. This is the compassion that I have learnt from Muhammad-the prophet of mercy, Jesus Christ and Lord Buddha. This is the legacy of change that I have inherited from Martin Luther King, Nelson Mandela and Muhammad Ali Jinnah. This is the philosophy of non-violence that I have learnt from Gandhi Jee, Bacha Khan and Mother Teresa. And this is the forgiveness that I have learnt from my mother and father. This is what my soul is telling me, be peaceful and love everyone. The wise saying, "The pen is mightier than sword" was true. The extremists are afraid of books and pens. The power of education frightens them. They are afraid of women. The power of the voice of women frightens them. And that is why they killed 14 innocent medical students in the recent attack in Quetta. And that is why they killed many female teachers and polio workers in Khyber Pakhtunkhwa and FATA. That is why they are blasting schools every day. Because they were and they are afraid of change, afraid of the equality that we will bring into our society. 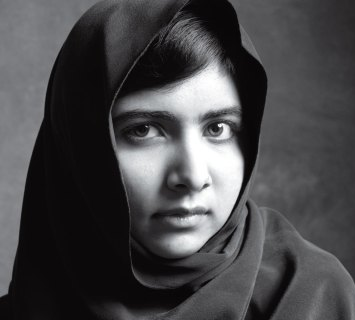 I remember that there was a boy in our school who was asked by a journalist, "Why are the Taliban against education?" He answered very simply. By pointing to his book he said, "A Talib doesn't know what is written inside this book." They think that God is a tiny, little conservative being who would send girls to the hell just because of going to school. The terrorists are misusing the name of Islam and Pashtun society for their own personal benefits. Pakistan is peace-loving democratic country. Pashtuns want education for their daughters and sons. And Islam is a religion of peace, humanity and brotherhood. Islam says that it is not only each child's right to get education, rather it is their duty and responsibility. So today, we call upon the world leaders to change their strategic policies in favour of peace and prosperity. We call upon the world leaders that all the peace deals must protect women and children's rights. A deal that goes against the dignity of women and their rights is unacceptable. We call upon all governments to ensure free compulsory education for every child all over the world. We call upon all governments to fight against terrorism and violence, to protect children from brutality and harm. We call upon the developed nations to support the expansion of educational opportunities for girls in the developing world. We call upon all communities to be tolerant - to reject prejudice based on cast, creed, sect, religion or gender. To ensure freedom and equality for women so that they can flourish. We cannot all succeed when half of us are held back.We call upon our sisters around the world to be brave - to embrace the strength within themselves and realise their full potential.